Why do you belong to the AGD? To track C.E.? Discounts for national meetings? Insurance Discounts? Well this is an article of why I got involved in the AGD and the journey it has taken me on. After graduating from the University of Minnesota’s School of Dentistry in 1988, I joined a practice with my father and brother. That gave me incredible insight into how much I DID NOT know about dentistry. With my father’s love of continuing education, I was motivated to start taking courses to fill in the gaps left by a 4-year dental education. I took courses by Harold Shavell, Lloyd Miller, Peter Dawson, Jack Turbyfill and others. It wasn’t long before I started questioning denture techniques, esthetics, centric relation and began a journey that I am still on 27 years later. After taking several AGD sponsored courses and realizing that I would need to track these hours I began my journey toward Fellowship in the AGD. The 600 hours of continuing education seemed like a lot but I was already amassing a lot of C.E. and thought it should go towards something. 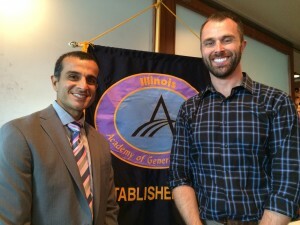 That’s when I took a serious look at becoming a Fellow of the Academy of General Dentistry. AGD is my organization as it was founded and is run by general dentists and it is the only organization that solely advocates for general dentists. I signed up for the Fellowship review course at Marquette dental school and for several days I received updates on all aspects of dentistry. Under the guidance of Dr. Lou Boryc (a leader in the WIAGD) and his wonderful instruction, I studied vigorously for the fellowship exam and wondered why I would ever subject myself to something this hard after completing dental school! Well, always enjoying a good challenge I took the exam and passed. The award ceremony in Nashville Tennessee further cemented my relationship with the AGD. 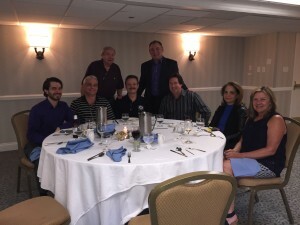 The doctors I met such as Chris Hansen and John Olsen (current Board members and past Presidents of the WIAGD) showed me the caliber of people that pursued high-level dental education and made me want to be a part of this group even more. Let’s fast-forward to what that springboard has done for me. I met two mentors Dr. Leonard Machi (past president of the WIAGD and current Board of Director) and Dr. John Werwie (past WIAGD president) both who opened their offices to me to learn and become motivated to understand implant dentistry. I went to the Misch International Implant Institute and went through both the Prosthetic and Surgical continuums. All along, the AGD was always on my mind, so I continued to photograph my cases (even the failures), and document all the treatment I had performed. This habit allowed me to effortlessly get my Fellowship, Mastership and Diplomate in the International Congress of Oral Implantologists. By now, the quest for the best information, the best courses and self-fulfillment led me to pursue the Diplomate in the ABOI or American Board of Oral Implantologists/Implant Dentistry. Again, as I was studying everything from pharmacology, anatomy as well as prosthetic principles, I asked myself why am I doing all of this studying? Well, the review course taught by Dr. James Rutkowski was worth challenging the boards, as it was the best review course on implant dentistry I have ever taken! The materials they sent home with me to learn were worth the price of admission alone. I met so many amazing dentists on my journey and I had a true Deja Vu experience studying for the DABOI just like when I was studying for the FAGD exam. I began to realize that these awards meant very little to others but the journey was everything to me. I am a general dentist. I joined the AGD to take good classes and track my C.E. credits. I have decided that as long as I am practicing a profession I love, I should continue to get better, to learn and to practice at as high a level as I personally can achieve. The article I wrote entitled,” General Dentistry As A Specialty” sums up my feelings on the role continuing education should play in a dentist’s career. We all need to be specialists at our profession of general dentistry. So I ask all of you, “What do you do to enjoy your profession?” I don’t think we are unique in Wisconsin in that we have had to cancel two of our C.E. courses due to poor attendance. As a member of the Wisconsin AGD Board, we have tried to ask people what they need and want for quality C.E. and we still don’t completely understand what AGD dentists want. We, like many of our fellow constituents are fortunate to have leaders in the WI AGD that are general dentists who are truly specialists in Implants, Sleep Apnea, Pathology, Dermal Fillers, Botox, TMJ, and Cosmetics. These leaders help to put on quality continuing education programs and preserve our rights as general dentists to perform all aspects of dentistry at the highest levels! The letters after our names may seem like alphabet soup with the awards we have achieved, but in reality they are crafted from a love of lifelong learning, pursuit of our ideals, diligence, discipline, and patient centered and evidence based dental pursuit of our own self-actualization. I invite all of our members to participate in AGD continuing education programs and events. Please drum up interest in the AGD and help us become the leaders of dental continuing education and excel in the pursuit of excellence that our charter mandates. I invite all of you to join me on my journey! Where will your journey lead? Richard B. Winter D.D.S. M.A.G.D. D.I.C.O.I. D.A.B.O.I./I.D. F.I.C.D. F.A.D.I. 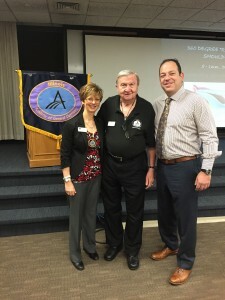 During my 30 years of service in the United States Navy Dental Corps I always looked forward to the local continuing education hosted by the Academy of General Dentistry to “tie” me to the community. This was especially true of my time spent in Illinois at the Great Lakes Naval Training Center. The Illinois Academy of General Dentistry was most collegial in its welcome acceptance of those from the military such as myself (now serving as the President of the IL AGD). 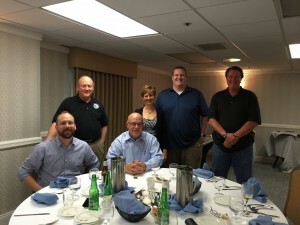 In addition, since the military members were from all over the United States and presented an extensive breadth of training and experience, we were also invited to provide continuing education. I believe this is the major draw for the IL Agd continuing education program in that we offer such an extensive breadth of continuing education opportunities. Not just from the military but also because Illinois is the home to the AGD, the ADA, the Chicago Dental Society as well as three dental schools. 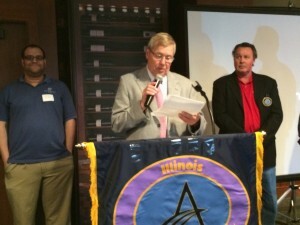 I welcome everyone to attend the local Illinois CE that brings with it the latest and most extensive programs available anywhere in the U.S., if not the world. 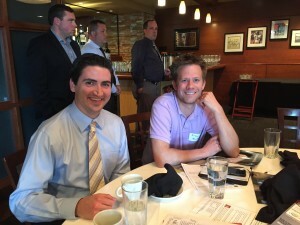 I look forward to seeing you at the next CE event. P.S. 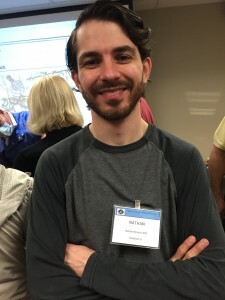 I would be very remiss if I did not plug the 2016 CDS Midwinter Meeting. My good friend Dr. George Zehak (prior IL AGD President and very active AGD member) will commence his CDS Presidency in 2016. Save the date February 25-27, 2016, for the 151st CDS Midwinter meeting. P.P.S. As you can see from my message above I am a firm believer in organized dentistry. All of us as General Dentists should belong and be active in both the AGD and the ADA- at all levels. The Mastertrack team headed by Drs. 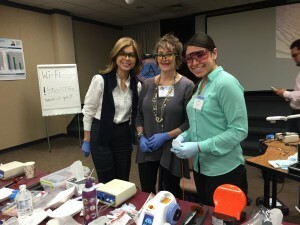 Sy Wachtenheim and Cheryl Mora with Drs. 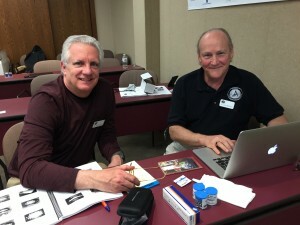 Doug Brown, Tom Wachtel, George Zehak, Jim Reichle, and Bill Lawley hosted a fabulous weekend continuing education program to a packed house of forty-one participants at the Bisco Auditorium in Schaumburg on April 17-18, 2015. 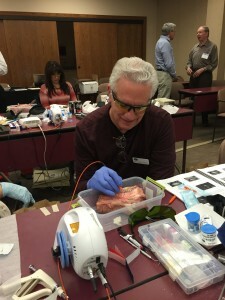 Dr. Ron Kaminer from New York presented a dynamic lecture filled with extensive hands-on techniques utilizing innovative technology. 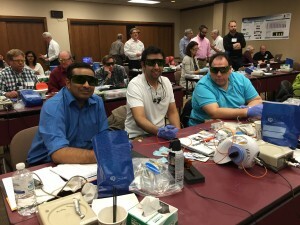 Participants were able to experience hands-on laser use on pig jaws, veneer preparation on models, digital impression scanning of prepared models, and cementation techniques. 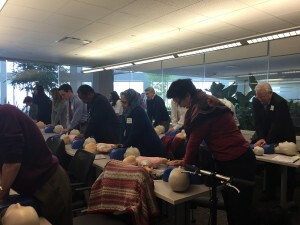 It is a unique seminar that exposes the participants to such a varied and extensive hands-on experience. When designing a patient’s smile, Dr. Kaminer recommends that many intraoral and facial pictures be taken to facilitate communication with the dental laboratory. Diagnostic wax-ups will help the patient to visualize the final result. For the best cosmetic results, he wants the horizontal alignment of the upper incisors to be perpendicular to the long axis of the face following the lower lip line in a “gull-shaped” configuration. A full buccal corridor is important for optimal aesthetics. With Dr. Kaminer’s preferred electric handpiece, he will place the margins of veneers interproximally, and will use a DC 1.0C depth cutting bur and a 782.10F bur to prepare the veneer, and finish with a chamfer on the lingual, remembering to keep all of the internal line angles rounded. When taking crown & bridge impressions, he uses the diode laser to trough around the tooth for hemostasis and to expose the margins as opposed to placing cord. When purchasing a diode laser, he feels a “diode is a diode.” When cementing veneers, Dr. Kaminer places all the veneers on the teeth at the same time. He prefers Duo-Link (Bisco) cement for the premolars and Choice (Bisco) cement for the anteriors. He utilizes two curing lights- one on the buccal and the other on the lingual. Tying a knot in the floss makes for easy clean up. Having the exposure to the hands-on use of the lasers and digital impression scanners was a tremendous advantage to the experience of this course and was due to the foresight of the Mastertrack team and Dr. Kaminer. Dr. Kaminer received his D.D.S. 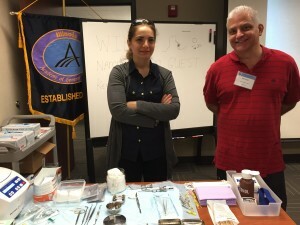 from SUNY at Buffalo School of Dental Medicine. He evaluates new dental materials for the Catapult Group and sits on their advisory boards and is a clinical consultant for numerous dental manufacturers. He has authored numerous articles on dental lasers and minimally invasive dentistry. 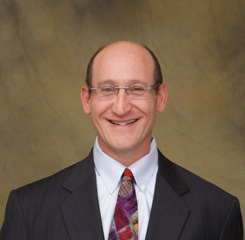 Dr. Kaminer is a frequent contributor to Mentor magazine and is an associate editor for Dental Product Shopper. Victor Rendon, Yeugen Tkachuk, Aaron Eissens. Doing good dentistry you gotta wear shades! 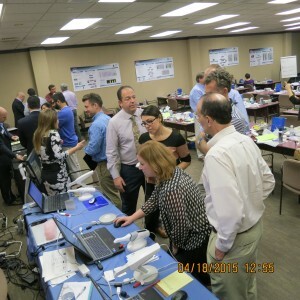 On May 15-16, 2015 twenty-eight dentists were treated to an exceptional two day continuing education seminar presented by Dr. John Olsen, MAGD from Franklin, Wisconsin. 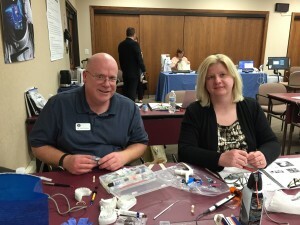 The Illinois & Wisconsin IL AGD Mastertrack program hosted the program at Patterson Dental in Wood Dale, IL. Those in attendance were awarded with a hands-on demonstration of Botox and dermal filler injections on live models brought in from Dr. Olsen’s practice. The doctors also learned about L-PRF which is the autogenous combination of platelet rich fibrin derived from a patient’s blood. 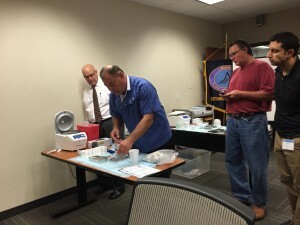 Dr. Olsen, who is also a trained phlebotomist collected blood samples from his assistant, and a volunteer dentist at the course to demonstrate how the L-PRF (platelet rich fibrin) is prepared in the “IntraSpin System” by Intra-Lock. 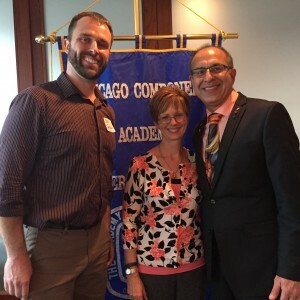 Exposure to this kind of CE with the very reasonable tuition that is charged elevates our Mastertrack series to a very worthwhile and beneficial membership benefit of the Illinois AGD. Not many dentists are privy to this kind of experience and information at such a reasonable cost. 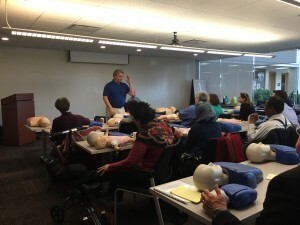 Dr. Olson reviewed the different mandibular nerve block techniques: inferior alveolar, Gow-Gates, Akinosi, infraorbital, and greater palatine block. In areas of acute infection where an incision and drainage is indicated he recommends using Carbocaine (mepivicaine) without epinephrine. To treat acute infections, he recommends a combination of metronidazole 250mg and amoxicillin 250mg q6h for ten to fourteen days. In the participation session, various bone grafting and suturing procedures were demonstrated and practiced on models utilizing L-PRF, mineralized cancellous bone and collagen plugs. Dr. Olsen demonstrated how to properly inject dermal fillers on his assistants and the Dysport (Botox) was injected into the various volunteers by the doctors. 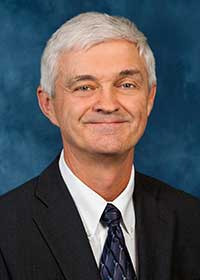 Dr. Olsen received his dental degree from Marquette University in 1991, and is a graduate of the Illinois and Wisconsin Mastertrack program, receiving his Mastership in 2008. Dr. Olsen is Diplomat in the International Congress of Oral Implantologists and a fellow in the International College of Dentists and the AGD Regional Director for Wisconsin. The IL & WI Mastertrack provides two full scholarships for each Mastertrack course to new AGD Members who graduated less than three years ago. The recipients of the scholarships for this were Dr. C.J. Yoon and Dr. Nathan Bessani. We would like to thank our sponsors for this fabulous seminar. Without their help this would not have been such a successful CE event. 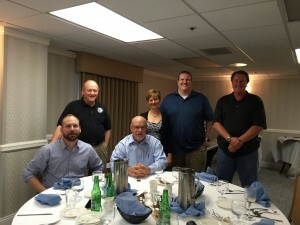 The volunteer leaders for of the IL & WI Mastertrack program are Dr. Sy Wachtenheim-director, Doug Brown, William Lawley, Cheryl Mora, Jim Reichle, Tom Wachtel and George Zehak. Our 2015-2016 Mastertrack Season begins on Friday, September 18-19, 2015 on Orthodontics with Dr. Neil Warshawsky at Henry Schein Dental in Elmhurst, IL. Don’t miss this high energy course that will jumpstart your practice on Monday. Register online at www.ilagd.org. A medical emergency in our dental office! We hope it will never happen, but we have to be ready. Dr. Mohamed Harunani, DDS, MAGD, presented a comprehensive, interactive, and participatory session on prevention, preparation, recognition, and management of medical emergencies in a dental office, on Friday, March 13, 2015. A well-prepared “Doctor Guidebook” and several beautifully laminated colored charts were given to the participants. 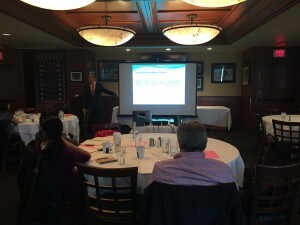 Topics discussed included: syncope, hyperventilation, foreign bodies in the eyes, asthma attacks, airway obstruction, allergic reactions, angina, MI, hypo/hyperglycemia, hyper/hypotension, seizures, strokes, external bleeding, congestive heart failure, acute adrenal insufficiency, and adverse drug reactions. 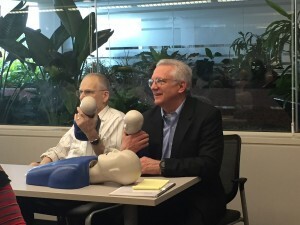 He shared many pearls of wisdom from his 30 years of practice, such as the need to take a complete medical history on your patients every 3 years, and to be aware of the expiration dates on your supply of emergency medications. Dr. Harunani welcomed audience participation, which led to sharing of many personal stories. We all enjoyed learning from the speaker and from each other. 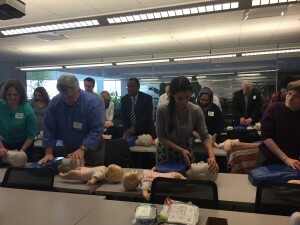 For the other half of the day, Mr. Michael Egan, provided American Heart Association CPR recertification for healthcare providers. The sessions were useful, well paced, light-hearted, and well received. Artistic Dental Studio (Dan Porter), DENTSPLY (Lauren Ritshard), Digital DOC (Rob Berg), ORASCOPIC (Alexandra Orr), PNC Bank (David Bell, Randy Novak, Mackenzi Mondesir), and Sequoia Dental Studio (David Johnsen). 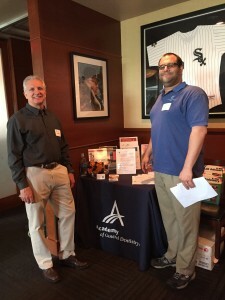 The Chicago AGD would also like to recognize our sponsors who provided raffle prizes: PNC Bank ($100 cash gift card), Sequoia Dental Studio ($100 cash gift), and Dentsply (box of Essix Plus Plastic, $200 value). What can give a dental office a good return on investment (ROI)? Dr. Parag Kachalia presented a comprehensive and detailed practical guide that identified key areas of technology advances that can move a dental office to the next level of patient care. He focused on technologies and materials that improve efficiency, delivery of care, patient experience, and practice management. Furthermore, the bulk of the program introduced advances that require an investment of $5,000 or less, yet generate a measurable return on investment. 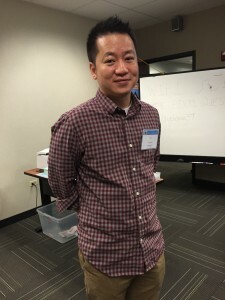 He presented information on diagnostic technologies, treatment planning/patient education, adhesive dentistry, erosion, dental materials for fixed prosthodontics, and CAD/CAM technology. 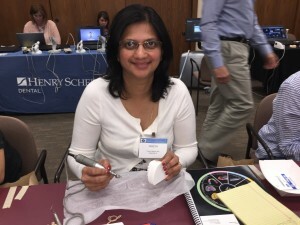 Some of Dr. Kachalia’s favorite technologies and materials used in his office include: SoproCare (imaging of caries, dental plaque and gingival inflammation using spectra dopplar technology), Dexis go (patient case presentation app for iPad), Isolite (illumination, aspiration, & retraction device), iPads, 3M True Definition Scanner (digital impressioning device). 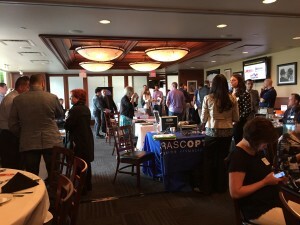 Artistic Dental Studio (Sheila Bajus), Bisco (Norma Gilch), DENTSPLY (Lauren Ritshard), Digital DOC (Rob Berg), Henry Schein (Justin Jourdan, Frank Chambers), Hiossen (Kasey Choi), Independent Manufacturers (Matthew Schroeder), Ivoclar (Angela Ward), Kattenbach LP (Tim St. Clair), Nobel Biocare (Lindsey Russ), MoGo (Mary Lukaszczyk, Daniel Vicich), ORASCOPIC (Alexandra Orr), PNC Bank (David Bell), and Solutionreach (Sean Field). 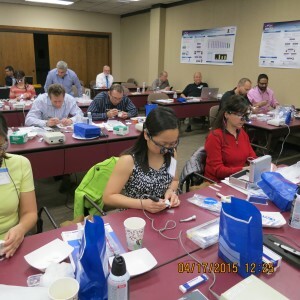 The CAGD 2015-2016 Season begins on September 9, 2015 with “Real World Implant Dentistry” with Dr. Joseph Kim. Sign up for a Season Pass to all four program for only $400 this year! Register online at Chicagoagd.org. The Academy of General Dentistry (AGD) is pleased to announce that Mohamed F. Harunani, DDS, MAGD, of Rockford, Ill., will continue to serve as the association’s treasurer—a position he has held since 2014. Dr. Harunani has been involved in the AGD since his first days in practice, holding various positions at the state and national levels. He has served the Illinois AGD in numerous roles, including as board member, secretary, treasurer, vice president, president, and delegate to the AGD House of Delegates. Nationally, he was the founding member of the AGD Investment Committee and has served on it since 2004. 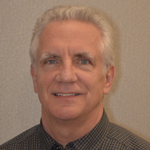 He has been the AGD representative to the American Dental Association (ADA) Standards Committee on Dental Informatics since 2005 and in 2015, he received its Volunteer Award. He also served on the AGD Board from 2006 to 2011.In 1997, Dr. Harunani earned his AGD Mastership Award, the association’s highest honor and one of the most respected designations within the profession. 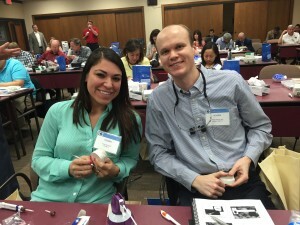 To accomplish this goal, he completed more than 1,100 hours of dental continuing education. 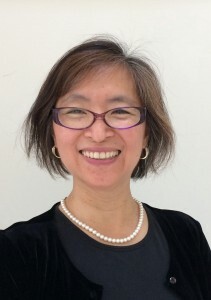 He also received AGD Awards for Excellence in 1997 and 1998, Lifelong Learning and Service Recognition in 2007, and the prestigious Albert L. Borish Award in 2012. Dr. Harunani is a fellow of the American College of Dentists, International College of Dentists, and American Dental Institute, as well as a diplomate for the American College of Forensic Examiners. He also is a member of the ADA, Illinois State Dental Society, Chicago Dental Society, and American Association of Dental Consultants. Dr. Harunani graduated from Northwestern University Dental School in 1986 and went into private practice with his brother, Dawood Harunani, DDS, MAGD. During his career, Dr. Harunani has served as a consulting dentist for several institutions, and he chaired the Ogle County (Ill.) Board of Health from 1998 to 2006. In 2005, Dr. Harunani transitioned into the dental director position at the Midwest Dental Support Center (MDSC). Today, he is involved in various dental- and nondental businesses, and he also serves as the director of clinical education for the MDSC. Dr. Harunani and his wife, Faiza, have three children, Shazeen, Farzeen, and Abdulkareem. He enjoys spending time with his family, traveling, exploring new cuisines, understanding new businesses, fishing, and diving. The Illinois AGD would like to welcome these new members! We hope you enjoy all the benefits that you will gain by being an AGD member. If you have any questions please email Dr. Cheryl Mora, IL AGD Membership Co-chair at [email protected].